Reach your health and wellness needs with a coach who creates a customized plan for you. Unable to make it to a training facility? Looking for a program to help you take the guesswork out of what you are currently doing? Bored with the same old routine? Want to be kept accountable? 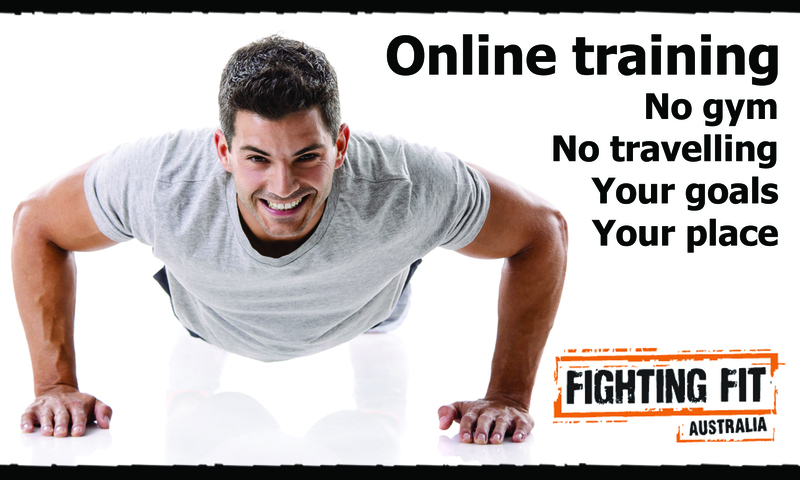 Fighting Fit Australia’s online training offers indiuliased programs specific for your needs. Programs are designed for a four week period and are best accompanied by an initial consultation prior to commencing any individual plan. The initial will take 45-60 minutes and is designed to see where you are at and what you have access to, which then gives us an indication on how to structure a specific program for you. Programs take 5-7 working days to complete following the initial consultation. We pride ourself on reciprocal relationships. Clients will receive a 30-60 minute cosultation every month. It is the clients responsibility to schedule these in advance. The purpose of these regular consults are to create a dialogue and build the relationship between client and coach. In addition, the client has unlimited access to the coach via email, text message or messenger. Such communications is highly encouraged. As a coach we will always know where the client is mentally in his/her training, and the coach can answer any queries the client may have in relation to training, mental health or nutrition. We are far more then educators. We are role models and mentors that have far reaching impacts on the lives of others. Info@fightingfit.net.au or 0421 931 182 to find out more.